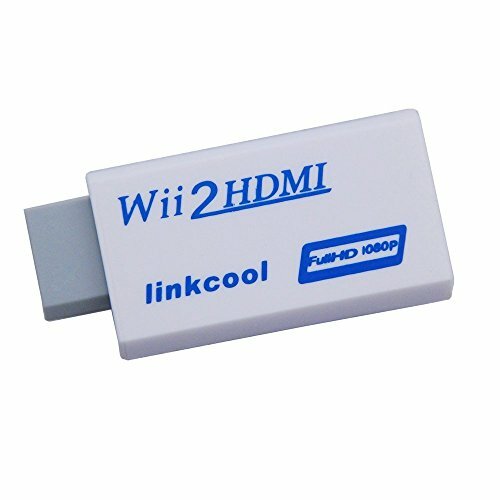 Linkcool Wii2 HDMI, a great mini converter for the Wii console, outputs video and audio in full digital HDMI 720p or 1080p format and supports all Wii display modes (NTSC 480i, 480p, PAL 576i). With just one HDMI cable, plug and play for true-to-life video/audio effects on your HDTV/monitor. Package Included: Wii to HDMI Converter x 1. video-converters. 1.Small and exquisite appearance, it is convenient to carry. 2.Supported Video input Mode: Includes all the display modes of the Wii console. (NTSC 480i 480p, PAL 576i). 3.HDMI upscale to 720p or 1080p high definition output. 4.No Transmission Loss:provides advanced signal processing with great precision, colors and resolutions. 5.No power adaptor, no messy cords¡ªjust one HDMI cable. 6.HDMI upscale to 720p or 1080p high definition output. 7.Hassle Free! Plug and play as you go.